Hockey League Wild Match game is loading.. 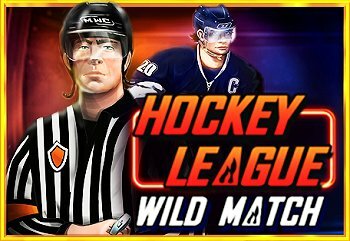 Play the new Hockey League Wild Match slot from Pragmatic. The Wild Match is on in Hockey League, the 3×5, 9 lines videoslot. The teams are clashing from left to right and right to left and when The Gloves Are Off, wilds can fill the whole reels. Try Hockey League Wild Match and win the match in the Free Spins feature where all your wins are multiplied by 3x! Hit 3 or more Scatter symbols anywhere on the reels to get up to 25 Free Spins. All Free Spins wins are multiplied by 3. 5 Scatter Symbols gives 25 Free Spins and pay 20xTotal Bet. Wild Symbol substitutes all symbols except for Scatter Symbol. Random Stacked Wilds Feature occurs randomly before the completion of any spin. It can occur on any combination of reels 2, 3 and 4. When it occurs, designated reels are fully covered with wilds. Scatter pays and triggers Free Spin Round even if it is covered by stacked wilds.